The Lync Online application is designed to be a beautiful and social experience for the users. The high-quality treatment of pictures enables you to have a sense of actually seeing the face of the person you are communicating with — a fundamental element of social interaction. The pictures displayed in Lync are picked up from your profile photo in the SharePoint Online My Site feature. To the left of your picture, you’ll find a vertical bar that shows the color of your presence state or status. Your presence is automatically updated by the system. Based on your Outlook calendar appointments, your presence displays “In a meeting” if your calendar is blocked as busy, “Available” if your calendar is open, and “In a call” if you pick up your Lync phone to make a call. Having the system automatically update your presence is important so that people you work with will be confident of your presence state. If presence state was manually updated and people forget to update their presence, then the confidence goes down and so will productivity. 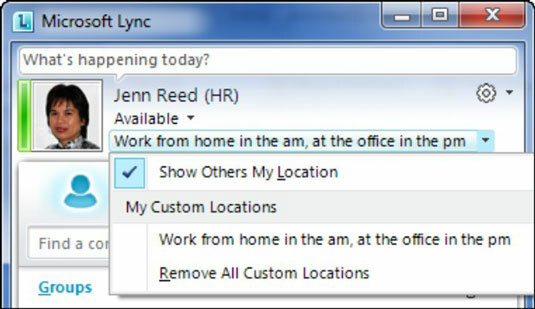 Another important feature of the Lync user interface is the Location feature. This feature’s social value is akin to Foursquare’s location-based social networking and Facebook’s check-in feature, which allow people to use global positioning systems (GPS) to let friends know where they are. 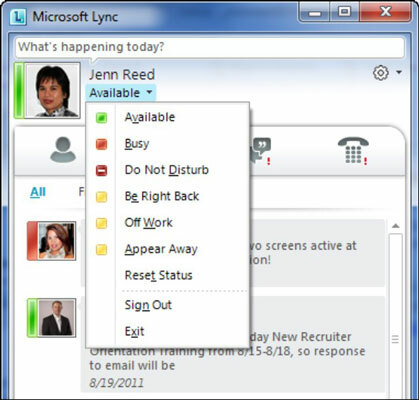 In Lync, you can enter your location manually or have the system automatically detect your location through wireless access points or the network to which you are connected. Beyond just location-based social interaction, Location was built to support enhanced emergency services or E911 capabilities. The idea behind Lync is to ultimately replace the enterprise Private Branch Exchange (PBX) system. Having a feature that not only knows how to reach you, but also knows where you are in an emergency is real estate worth its gold in the compact Lync user interface. When you hover over a contact’s listing, the contact card appears with more information to help you decide a course of action. For example, if your contact’s status says “Looking forward to my vacation in 3 days…,” you’ll probably want to reach out to her sooner rather than later. Monitor the presence of your team members by adding them to your contact list. You can give your contacts a group name and get creative in sorting and displaying the information. The only caveat is that you can’t add more than 250 contacts to your Lync contacts list.